"The more you listen to Salley and experience his wondrous contraptions, the more you lose your bearings between reality and fantasy. The Musée Patamécanique turns out to be an intellectual hall of mirrors. It is a museum for questioning museums, and art, and science, and officialdom, and facts, and the world." 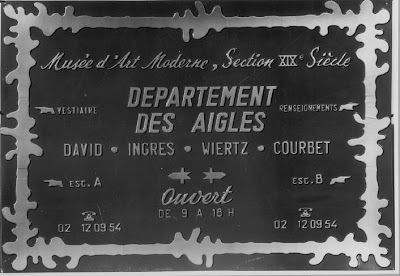 "The Musée Patamécanique is part of a growing body of art that adopts the language and trappings of officialdom. Examples include Los Angeles's Center for Land Use Interpretation, the Center for Tactical Magic from Oakland, Calif., and, locally, the Institute for Infinitely Small Things, the National Bitter Melon Council, and the Institute for Applied Autonomy. In the world of pop culture, such adoption of fake authority can be found in parodies such as "The Daily Show" and "The Onion." "For artists, adopting official-sounding names -- along with convincing-looking websites and other packaging and marketing -- can be a way to question authority, frequently humorously, while often doing what the organization's names say they do." This kind of art isn't that new. Marcel Broodthaers created, the Museum of Modern Art's "Department of Eagles": an elusive exhibition from 1968 to 1971 of found objects with eagles on them and eagle-related art that he made, though the exhibition was really about appropriating the language and structures of museums and authorities, using the eagle, a symbol of power, as a metaphor. The cool thing about this was that he created an institution with many wings, for example, the Finance Section, which tried to sell the museum "on account of bankruptcy." Antoinette LaFarge, at UC Irvine, has created a whole site, unfinished as of yet, on the idea of Fictive Arts, "...a term I started using in 2001 to describe a particular form of aesthetic production that doesn't belong to any one field. Fictive artworks have clearly fictional elements but extend outside the realm of the purely fictive in various ways, principally through the creation of realia. A working definition of the term might be: credible fictions created through production of real-world objects, events, and entities." The thing I find fascinating about the whole Fictive Art movement, and its bevy of predecessors and spin-offs, is the combination of dreamlike logic and official phraseology, as if some half-remembered story has come true and is being promulgated by Those In Charge. 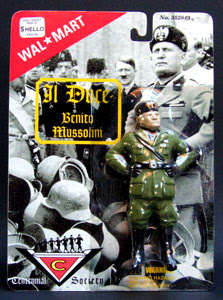 The sales clerk in WalMart is surprised and pleased to see they are selling Mussolini action figures. Wandering through the Museum of Jerassic Technology - one of my favorite places, and an inspiration for the Museé Patamécanique - one finds oneself surrendering, dreamily, to the dim and scholarly exhibits which carry that slight air of delapidation and poor construction one finds in so many small, old museums. One begins to believe what one is told, only to emerge, blinking, onto the bright and unforgiving streets of Los Angeles, wondering which reality is preferable. - The Centennial Society, which seems to be associated with Packard Jennings in some way (but clearly not with WalMart). - The Museum of Jurassic Technology, which I hope someday to write about in further depth. Its owner, David Wilson, is the subject of Lawrence Weschler's Mr Wilson's Cabinet of Wonder. - Fodor's reviews the Museum of Jurassic Technology! Clarification: KineticWorld is Chris Palmer's project - I'm just a contributor who hasn't actually contributed anything yet! now that was fascinating. thanks for giving me yet another list of interesting places to visit. I LOVE this blog and will be back again and again! the subtle details and histories are like the best kind of poetry, creating an imaginary world that could have been real, should have been real, but isn't.